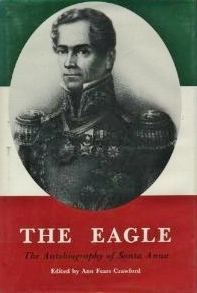 The Eagle is the memoir/autobiography of Gen. Antonio López de Santa Anna, sometime President and Dictator of Mexico. Originally written in his final exile in Nassau, the Bahamas, in the 1870s, the 1966 English edition was its first real time in print. If you’ve ever wanted to enter into the mind of a egotistical military dictator, the General’s memoir is for you. From his start during the Mexican War of Independence to his rise to general and president, through his defeats in the Texas Revolutionary War and the Mexican-American War, several exiles and homecomings, and many many other battles and skirmishes, it’s all here. Or at least his version of events is. This is one of those books where you need to keep a bookmark in the endnotes, because Santa Anna’s memory and the truth are usually not the same thing. You quickly realize that nothing is every his fault, unless it’s a good thing, and that great victories can be created out of nothing. He also has a habit of forgetting his opponents’ names (James Fannin becomes Col. “Fancy”, for example). According to the author, there’s only one person worth remembering in this book, and his name is in the title. Those with an interest in military history, the history of Mexico, Texas, or the American Southwest, or in how the minds of egomaniacal dictators work, will probably find some entertainment here, others may want to look elsewhere. Those put though Texas history in 4th and 7th grade will find the chapter on the Texas Revolution particularly enlightening/amusing.